Enos Molapo Makhubedu grew up in Pilgrim’s Rest where he completed his higher primary school studies in 1951 at the Charles Max Secondary School. From 1951 to 1958 he attended the Kilnerton Training Institution at Lady Selborne in Pretoria where two teachers, Mrs Lekala and Mr Selokwane, noticed his talent for drawing and colour. After his father’s death in 1964 he accepted full responsibility for the house and family. He befriended the artist Andrew Motjuoadi (1935–1968) and later Eric Lubisi. They both helped him in his artistic career. He also enjoyed the guidance of other artists such as Walter Battiss (1906–1982), Irmin Henkel (1921–1977), Otto Klar (b.1908), Martin Koch (b.1940) and Emil Schweikerdt. In 1969 Jan Krige of Menlo Park arranged for him to attend fortnightly lessons with Johann du Preez, an art student at the University of Pretoria. Makhubedu gained confidence in drawing and painting from life. He won the New Signatures prize in 1970. In 1995 Makhubedu and Lubisi were commissioned by Transnet to paint six panels on aspects of South African history for the Transnet corporate headquarters in Parktown, Johannesburg. From 1991 to 1998 Makhubedu headed Unisa’s Arts for All in Skinner Street, Pretoria. Prior to Makhubedu’s first solo exhibition, Walter Battiss wrote: ‘His art is remarkable for its originality of vision and its hyper-realism which gives his work importance today’.1 Like Nkoane Harry Moyaga (qv.) et al, he also works in the spirit of the Black Consciousness Movement. While these artists draw inspiration from African mythology and the legendary past, Makhubedu focuses on the dignity and beauty of people, their clothes and their environment. He works in oils and ink. His drawings in pen and ink are meticulously executed in the finest of detail. Makhubedu prefers to work from life. Yet, often neither models nor the means to travel to remote regions to paint country folk and their livelihood, are readily available. Therefore he often has to rely on photographs or pictures from which he constructs a convincing portrayal.2 He is adamant about accuracy of detail as every bangle or bead or colour is significant in conveying the status of the subject. In African herder (plate 221), the painstaking care with which this eligible young Pondo man has dressed himself articulates his self-assertion and readiness to advance into the future. The fighting sticks showing from beneath his cloak also indicate his readiness to demonstrate his sparring skills. Walter Battiss. 1972. Press release for the SA Association of Arts, Pretoria. Author communication, 20 June 2005. Born Eersterus, near Pretoria, 1938. Training No formal art training. Exhibitions 1966: Artists Under the Sun. 1972: Solo exhibition, Upper Gallery, South African Association of Arts, Pretoria. 1993: Pretoria Painters and Sculptors 1963–1993, Pretoria Art Museum. 1995: Spirits and images of Africa, South African Association of Arts, Pretoria. Collections Nelson Mandela Metropolitan Art Museum, Port Elizabeth; Pretoria Art Museum. 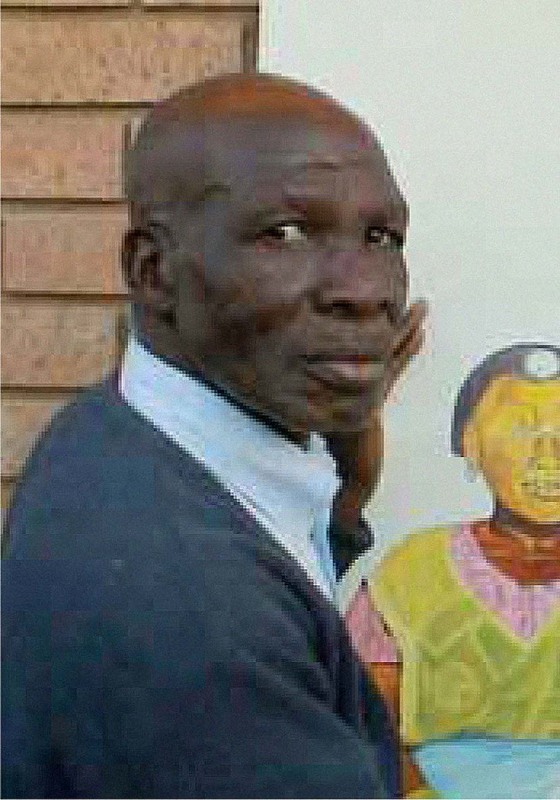 Photograph of Enos Makhubedu, photographed by Prince Dube, 2006.